Gas lines are an important part of any residential home. However, there can also be dangers associated with those gas lines. It is important that when any gas work is performed, it must be done by a qualified licensed plumber-Your life depends on the work of that professional. Gas piping is most often used for furnaces, water heaters, cook tops, ovens, and fireplaces. When you discover a gas leak Plummer Enterprises can help to locate and solve the problem. Below are some possible questions you may have about gas leaks, with answers to those questions. If your question is not listed here, please feel free to contact Plummer Enterprises at 419-740-7126 for the answer to your questions. What do I need to do if the gas company has come out and turned off my gas? Once the gas company has turned the gas off to your home, the next step is to contact Plummer Enterprise’s licensed plumbers. In a most situations a pressure test will be performed on the gas service, to determine if there are any leaks. Once the test is performed, leaks will be located and repaired, city code violations must be upgraded, and then your city will inspect the job. Once the city inspection and approval is given for the job, the city will release your gas system back to the gas company. The gas company must come back out to turn the gas back on. Due to the potential danger of gas leaks, it is always our recommendation to call the gas company to have them come out and shut off the gas immediately. Once the gas is shut off, the gas company will then inform you that you will need to call a licensed plumber to have them test, locate and repair the leak(s). What kind of pipe is used for gas systems? 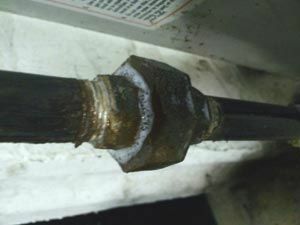 Gas leaks can be extremely dangerous even if it is only a small leak. If allowed to continue to leak for a long enough period of time, it can cause gas to build up in an area, and one small spark can cause a serious explosion. Gas leaks have caused many house explosions. All of these were due to gas leaks. Gas leaks are nothing to play around with and should be taken care of with urgency. Can I or should I try to fix a gas leak myself? Most cities will not issue permits to a homeowner when a gas leak is involved. They will only issue to a licensed and registered plumbing contractor such as Plummer Enterprises. It is a major safety and liability issue for yourself and others in your neighborhood to only have a licensed plumber work on your gas system. If you have any other questions, comments or concerns, please feel free to contact our office at 419-740-7126. We will be more than happy to help you.